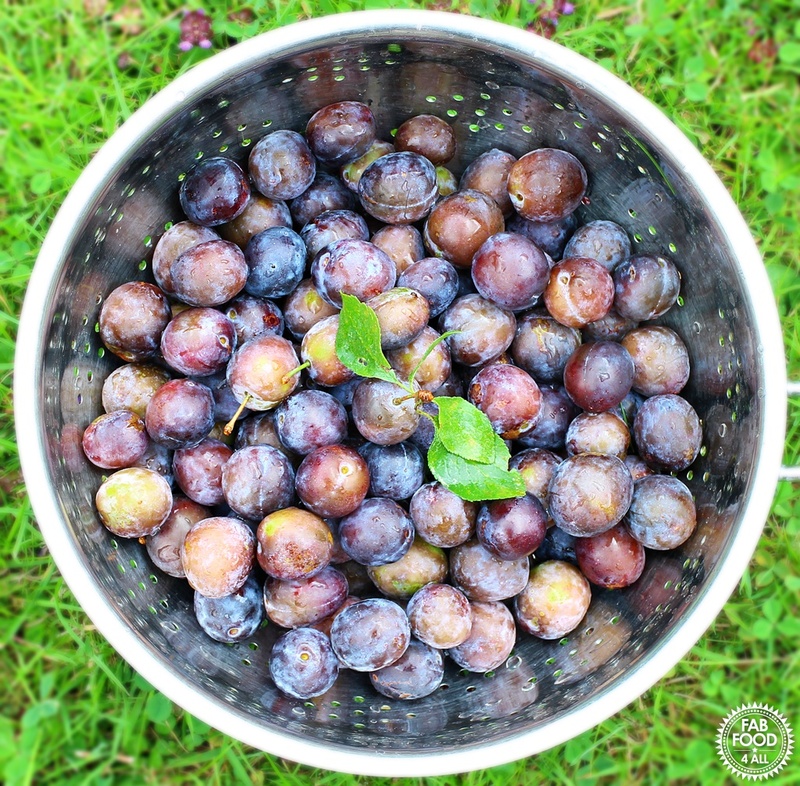 You are here: Home / Jam / Damson Jam plus my tip for quick pitting! Damson Jam plus my tip for quick pitting! 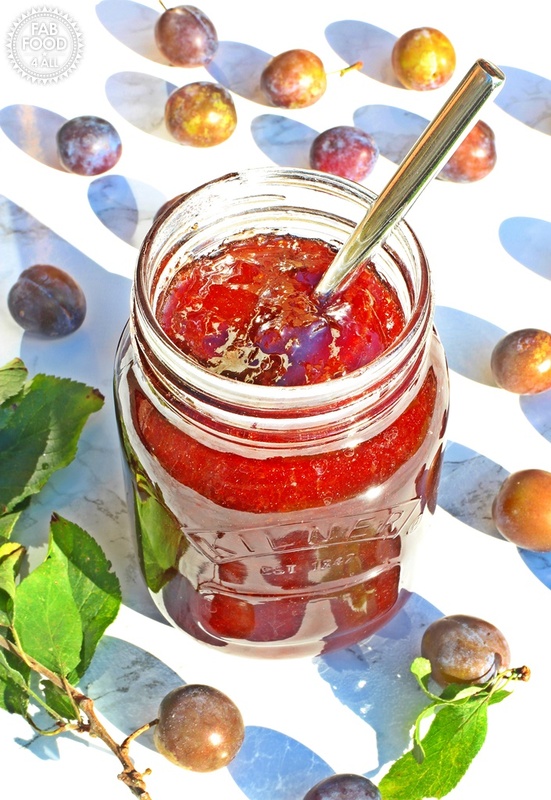 Today I’m re-posting my Damson Jam which was published in 2013 when I didn’t own or know how to use a professional camera. This recipe has been one of my most popular jams ever since so it was high time I did a re-shoot and gave it the presentation it deserved! I hope you approve. I have a confession to make, in the 40 years that my parents have lived in their current house I have never taken any notice of their Damson tree. When I was growing up we had a Victoria plum tree and a huge pear tree which dominated the garden but the Damson tree just minded its own business in one of the borders. The Victoria plum tree and the pear tree have long since languished but the Damson tree has soldiered on. So it took my new love of jam making for me to actually look forward to the harvest of Damsons that I’ve half-heartedly accepted bags of in the past. Yes shocking I know! So as with all my jams I like to have a good old research of my topic and find the best and most efficient way to make my next jam. It became apparent that this wasn’t a simple jam to make like all the other ones I’d made. With Damsons you have the sticky issue of the stone to contend with. Hence there were recipes where you either laboriously cut them out at the beginning or you had to wade through hot jam at the end to remove them. Kirstie Allsopp even suggested counting the plums so that you could be sure to have removed all the stones! Then there were useful tips I found like agitating the plums once cooked with a whisk to help loosen the stones before fishing out. Another tip I found which would have worked if my plums had all been really ripe, was to remove the stone by gripping the opposite ends of the Damson and squeezing thus releasing the stone. Sadly this only worked on a few of my plums and most of them were not ripe enough for this method. 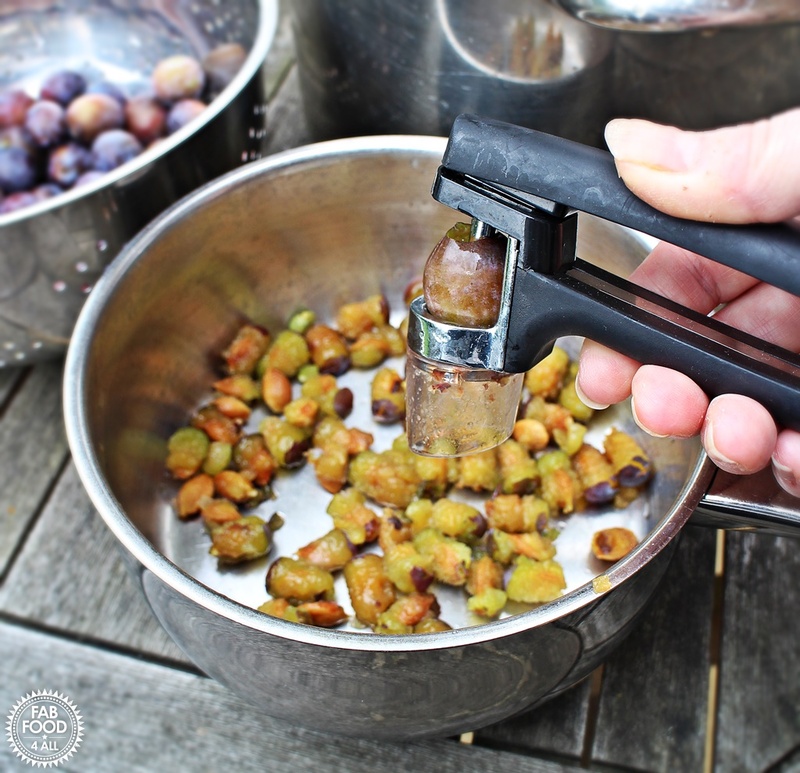 I came up with what I thought was a stroke of genius, I used my Oxo Goodgrips Cherry/Olive pitter as it is so sturdy and proved perfect for the job. I decided I didn’t fancy fishing for stones at the end of the jam making process with rubber gloves and I’m really glad I opted to remove them before. If I hadn’t I wouldn’t have known about the 3 rotten plums that had looked fine from the outside but were totally brown on the inside which would have spoiled the jam. The only problem with pitting the Damsons beforehand is that there is a certain amount of plum still stuck to the stone, which would also happen when using a knife or the squeeze technique. Not wanting to waste any flesh I decided to simmer my stones with a small amount of water and then to pop them in a sieve which seemed to be the best of both worlds and then the liquor could be popped back in to the pan with the simmered Damsons before adding the sugar. 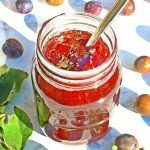 As Damsons are so delightfully full of pectin there was no need to add any other fruit or lemon juice to this recipe, they are the perfect fruit to make jam or jelly with. I had never eaten Damson jam before and it has a unique sharp edge to it which I have enjoyed especially at breakfast time. I made 8 pots of varying sizes but did measure the volume which was about 2.1 ltrs. I love chatting jam, so if you have any questions or want to tell me how you got on then do fire away in the comment section below! 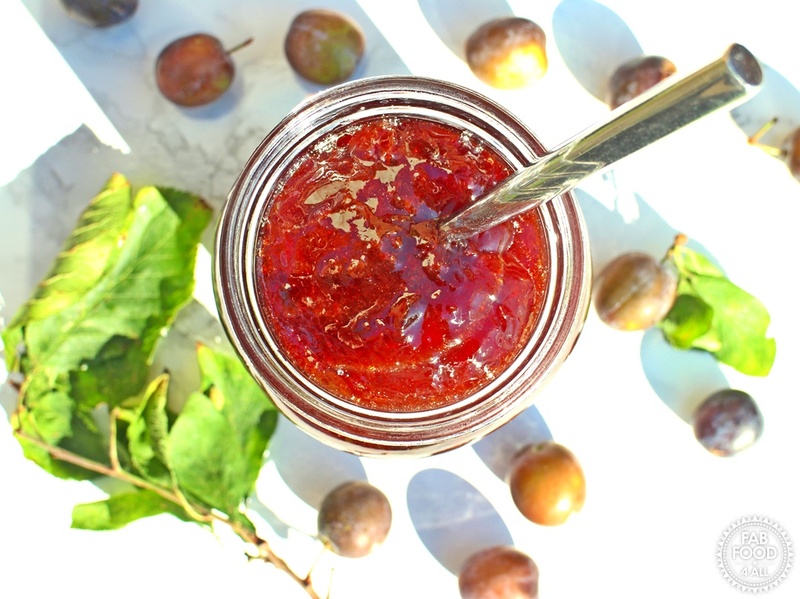 A beautiful tart Damson Jam perfect for using up your Autumn windfalls. At the same time cook the stones in a separate medium sized pan with 20 mls of water for 20 minutes. Sterilise jars by washing or dishwashing, filling with boiling water, emptying and then placing in oven for 20 minutes at 140°C then leave in oven until jam is ready. Wash the lids, sterilise with boiling water and then leave to drain. The Damson de-stoning tip is the best tip I have come across for ages, Many thanks for this it will cut down my de-stoning time next year. I find Damsons such a lovely fruit and have a big tree at my allotment so I’m always a little disheartened when loosing so much flesh. Not any more!! 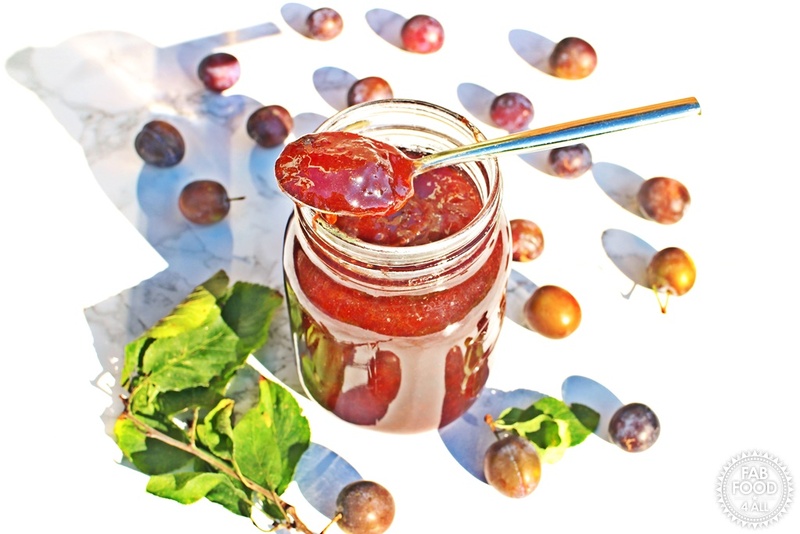 Just tried this recipe for my first ever foray into jam making – we moved into a new house and discovered a damson tree growing wild in the field behind the house and it is dripping with ripe damsons. Followed the instructions and wow, it worked – it even set! So delicious. Thank you. Thank you for your great article and advise. My story is, I used a potato masher to separate the stones from the flesh whilst in the pan- the wire S shaped type. It does a brilliant job without shredding the skins and leaving them more or less whole. I gently heated the 6lb of fruit with stones to release the pectin. The longer and slower its heated the more pectin is released which in turn means adding less sugar to help it set. I then spooned batches out onto a dinner plate which made it very easy to remove the stones. After I had done the whole lot it all went back into the pot to be heated with the sugar. Not very time consuming at all. I did a couple cold plate tests so I didn’t add too much sugar. I also used organic sugar which is slightly brown just for my own quirky personal taste. I have made over 40 jars so far and each time I have used less sugar with great effect. Thanks for sharing Jim. Just a word of caution not to skimp on the sugar too much as it will affect the keeping quality of your jam. That’s more valuable advise thank you very Camilla. I have 18 lbs of damsons to make jam.can I double or treble your recipe. Hi Avril, the issue with doubling or trebling a jam recipe is that you can end up with a jam that won’t set or that boils over the sides. So you could more than likely get away with upping the fruit to 2 kg which I use in my Mirabelle Plum Jam. The other solutions would be to use more than one pan or freeze the rest of your damsons for later use. Thanks for your helpful tips! Looking forward to trying your recipe. I see you don’t use preserving sugar, which I thought was advisable for damsons? Does it really not matter? I used preserving sugar in my very first jam and seriously didn’t like the stiff set it gave so ever since I have just used lemon juice or relied on the natural pectin levels in fruit. So no you don’t need preserving sugar in this recipe! Hi Annie, the weight is for the damsons including the stones. Thank you Camilla. The recipe worked beautifully and the result is delicious!